The Pepperdine University Student Activities Office at Seaver College will host The Mountain 2017, a live worship celebration led this year by contemporary Christian music band I Am They at Alumni Park in Malibu on Sunday, April 9, at 5 PM. 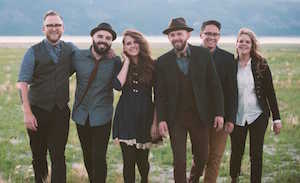 Formed in 2011 in Carson City, Nevada, I Am They began performing in 2008 as a worship ministry called Solomon's Porch for what was intended to be a one-night gathering at Calvary Chapel Carson City. After a positive reception from the church congregation, the six-member group began holding regular worship gatherings in the local community. In early 2009, after receiving an invitation to open for Christian singer-songwriter Matthew West, the band began producing original music and changed its name to I Am They in an effort to distinguish its national presence from its local church performances. I Am They released its self-titled debut album in January 2015. The band spent that winter and spring on the national Rock & Worship Roadshow tour alongside MercyMe, Crowder, and Group 1 Crew, followed by a tour with Matt Maher on the Saints and Sinners tour. In August 2015 I Am They earned a Dove Award nomination for New Artist of the Year. The Mountain is a student-led ministry that provides a time of worship, prayer, and community, as students, faculty, staff, alumni, local churches, and Los Angeles residents are united under the common banner of worshipping Jesus Christ. Each year, a well-known worship artist is invited to lead over 1,500 attendees in a night of worship, strategically hosted in mid-April to celebrate the ending of the academic year. Tickets are free for Pepperdine students, faculty, and staff, $8 for alumni, and $15 for the general public. For additional information about this event, and to register for tickets, visit The Mountain’s page on the Eventbrite website.